This Ford V8 Stack Injection kit is now available for the Ford 4.6 and 5.4 liter Quad cam motors. Kit includes manifold, studs and nuts, assembled throttle bodies, linkages, ram tubes, fuel rail kit with -6 or -8 AN ends. Mesh Covers are optional extra PN: 833-087. We rate our 50mm V8 Stack and Cross Ram kits at 580HP - 600HP. This, of course, does not mean that your engine will make that much power, but so long as the rest of the engine and tuning is up to it, this kit can support up to between 580HP and 600HP. We have lip seals behind the throttle shaft bearings to stop grease from being sucked out of the bearings under high intake runner vacuum. These are turned around on boosted applications so there is no boost leakage and also stops the bearing grease getting evacuated from the throttle shaft the bearings. We ask you if you are going to run your engine Boosted, or Naturally Aspirated so we can install the Lip Seals in your throttle bodies in the appropriate way to suit your application. We want to supply your Throttle Body Kit just the way you want it. That's why we offer both Sub Assembled Kits, and Full Assembled Kits. Due to overwhelming demand from our customers, we are transitioning our standard colour from Blue to Black. Black is a classic colour, and goes with pretty much every engine bay colour and style. This includes Ram Tubes, Linkages, Cable Pulleys, Drop Links, Bell Cranks, and more. Don't worry if you love blue, you can still get your kit in blue. There will be a small premium of $40 per kit to cover us sending out your kit of parts to be anodized blue. If you would like blue anodizing, please let us know by typing in the notes area of your order. Every single throttle bore and throttle plate are measured and matched as a pair to ensure the most perfect throttle fit and consistency across every EFI Hardware throttle body. Setting up your fuel system right the first time is easy if you follow the right instructions. The kit can be fully assembled prior to dispatch, the cost is an additional $270.00. The kit does not include TPS, Injectors, mesh ram tube covers or air filters. 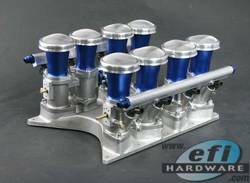 Other upgrade options include Pro Race throttle bodies in place of Pro Street $300.00. Special pricing on injectors and TPS Kit when buying a complete kit.